We begin with a visit at the Achilleion Palace & it's gardens. We then continue to Kanoni to admire the views & take photos of the famous Mouse Island & Vlacherena. 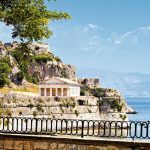 The tour ends with our visit to Corfu Town, which is a member of the World Heritage List (UNESCO). 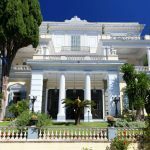 By guided air-conditioned taxi/coach we depart from Corfu’s Port for the old historical village of Gastouri and we arrive at the Achilleion Palace, the former residence of Empress Elizabeth of Austria and later that of Kaiser Wilhelm the 2nd. 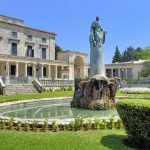 Here we visit the museum with mementos of the two royalties and enjoy the splendor of its landscaped gardens with statues, including the famous statues of the Dying Achilles & Achilles the Triumphant. 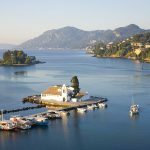 Afterwards, through the coastal road of Perama, we drive to the beauty spot of Kanoni, a suburb of Corfu town. 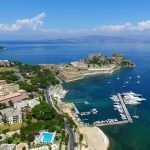 Here, we stop to admire the views and take photographs of the famous Mouse Island (reputed to be the petrified boat of Ulysses) and the small islet with the nunnery of The Holy Virgin of Vlacherena. 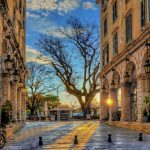 The residence of the British High Commissioner, a splendid Edwardian building, completed in 1824, once the seat of the Knights of Saint Michael and Saint George until 1864, and later the Palace of the King of Greece. The Church of Saint Spyridon, Patron Saint of Corfu with the rare icons and where the holy body of the Saint lies in a crypt.